I really like potatoes prepared in so many versatile ways! When travelling in the old days I could never get enough creamy potatoes Dauphinoise or buttery pommes Anna in France, fried with onions bratkartoffeln in Germany, patatas bravas or Spanish omelette in Spain, rosti in Switzerland, samosa with spiced potatoes in the Middle East and South Asia, poutine in Quebec, hash browns in the USA, mashed in the UK with more upscale purees internationally and more. Many versions of potato salad and potato chips out there. Fond memories of those minimum one pound gargantuan baked Idahos with sour cream at Seattle’s Canlis restaurant. Still enjoy hot crisp fries with a condiment of home made ketchup, mayonnaise, or vinegar. However these days I eat potatoes mainly at home sliced & oven baked (rather than fried) with olive oil. Also prepare sweet potatoes the same way. Do you still eat potatoes? What is your preferred method of cooking? 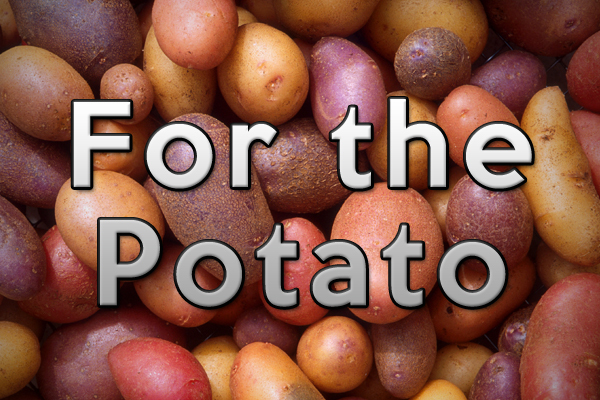 What's the best way to cook potatoes? One book that should be on every wine aficionado’s reading list is George Taber’s A Toast to Bargain Wines. Chronicling the numerous trends and developments throughout the history of wine, his chapter discussing the 1980s and early 1990s is a truly fascinating read. Known by many as the ‘neo-prohibition’ period in America, the lobbying group Mothers Against Drunk Driving (MADD) was at the apex in terms of political power, having wine (along with other alcoholic drinks) successfully lumped in the same category as marijuana and other “gateway drugs” plaguing society. With sales softening and multinational corporations like Nestle and Coca-Cola selling off their investments in the vineyards of California, the industry was clearly on the ropes. But on November 17, 1991, United States vintners got a gigantic boost from an unlikely source. For years, representatives from the wine lobby had been trying to educate both politicians and the general public about the supposed health benefits of drinking wine in moderation. All of these efforts however paled in comparison to the free publicity they received from America’s number one television program, with an estimated audience of over twenty million viewers who tuned in that night. 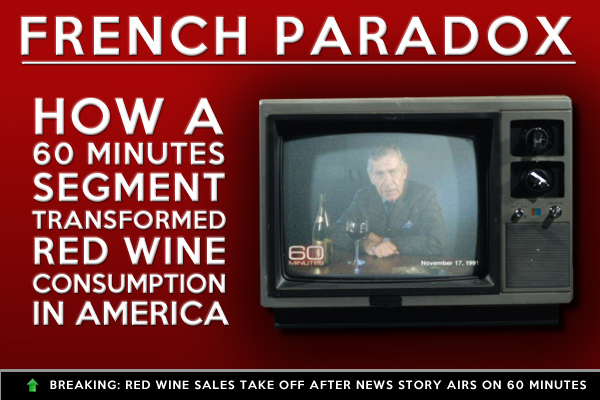 Hosted by Morley Safer, a 60 Minutes segment titled ‘French Paradox’ attempted to solve the mystery regarding French and American diets – and the odd results these contrasting diets had on the health of each nation. The former, which consumed such rich delicacies as foie gras, duck, black pudding, and forty pounds of cheese annually per person, remarkably resulted in less cases of heart disease than the latter. And yet, despite the fact that Americans exercised more regularly than their French counterparts, how could the average Parisian be in better health than the average New Yorker? The answer to this paradox: red wine. The segment boasted that by drinking at least one glass a day, the risk of heart attacks and blood clots would be greatly reduced. At least, that was the conclusion viewers were left with on that particular Sunday night. And on Monday morning, a tidal wave of consumer interest in red wine was rippling through the United States. Almost twenty-three years after the show first aired, the wine industry is still sending thank you cards to CBS! You can watch a four minute clip from the segment by clicking here. Is red wine the answer to the French Paradox? 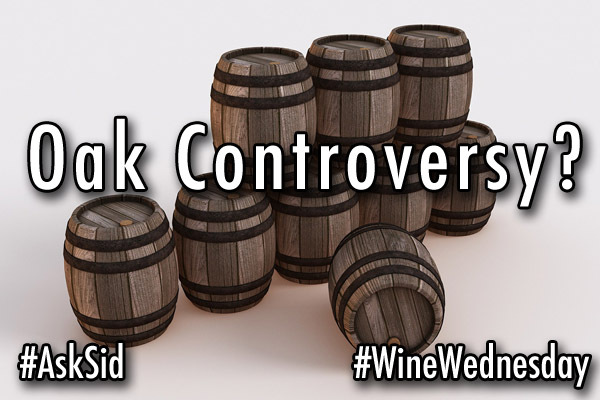 Question: What’s all the recent controversy about using oak during wine production? Answer: Don’t know if you can really call it a controversy. Certainly there is a lot of concern out there because some producers at the lower price range are strongly seasoning their wines with oak chips. However there definitely seems to be a growing trend to let many fresh fragrant wines show their best natural fruit. This element becomes more difficult to discern if you mask the aromas and flavours by putting the wine into oak – particularly new oak. Remember also that new oak is expensive and wineries can lower their production costs by using only stainless steel, concrete and the like. Chardonnay is one variety that definitely is seeing less new oak recently which allows the released wine to have vibrancy (like Chablis) and show more individual terroir of each grower’s specific site including their distinct soils, climate, elevation … There will always be some grand wines that benefit from oak – even 100% new oak – like Chateau d’Yquem in Sauternes and First Growth Bordeaux. 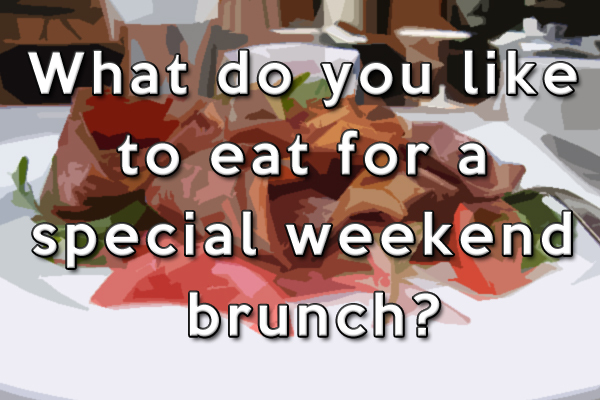 What do you like to eat for a special weekend brunch? Café Medina (www.medinacafe.com) has been a brunch (plus breakfast & lunch) institution in Vancouver since 2008 and always jammed. Now they are moving to new expanded facilities opening August 12 with a brand new expanded menu. They have left off the usual mainstays of omelettes and eggs benedict for more avant-garde choices. Executive Chef Jonathan Chovancek invited a few of us yesterday to be guinea pigs trying out his Sunday Brunch new ideas. Mimosa of course but lots of sodas including root beer floats. Satisfying coffees. Liege style waffles (les gaufres) and babeurre pancakes (crepes) with diverse toppings. Blistered wood stone fired flatbread & grilled focaccia. Fricassee Champignon. Spicy lamb meatballs, merguez sausage or braised in wine short ribs with poached or fried eggs all with lots of stewed vegetable and potatoes. Great side dishes including babaganoush (eggplant), raita (yogurt condiment), mascarpone & black pepper honey, chickpea hummus, quinoa tabouleh, home cured bacon & apple gastrique, sunflower tahini and more. Innovative & delicious! Vote for your go to brunch item. 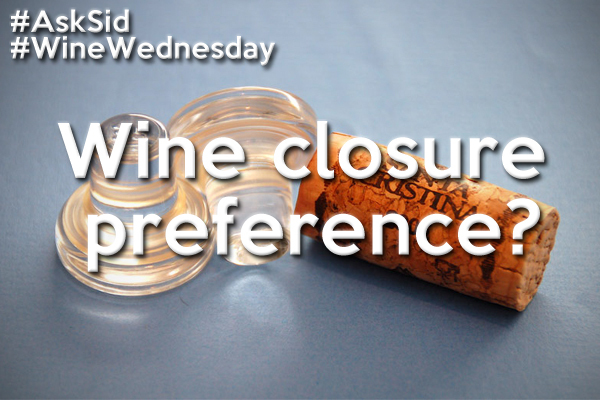 Ask Sid: Wine closure preference? Question: Sid with all the different wine closures out there I wondered if you have a distinct preference? Answer: You are right. What a change in wine closures on the market now. For aged wines I have been a long-time cork supporter but like everyone else frustrated by the TCA cork taint problems. Easy to use screw caps are becoming increasingly popular and certainly work well to preserve fresh fruity aromatic wines. Some reductive issues still remain. Not that keen for synthetic stoppers. Like the innovative glass stoppers and being able to recap but they need individual attention to fit the specific bottle necks. The hottest new alternative especially for more expensive wines is high quality Diam processed cork held together with a polyurethane-like glue. Recommend an excellent article on “Debating Diam” this week in Decanter by Andrew Jefford which can be found here. Impressed to note that “three billion corks since 2005 and haven’t had a single case of TCA coming from the cork itself” and “polyurethane binder…completely neutral from a sensorial point of view…glueyness had to be imaginary”. Like what is happening so far with Diam!